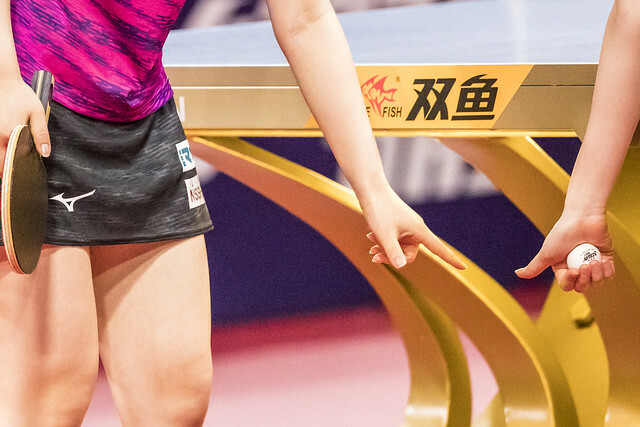 A formidable pair but not seeded, China’s Gu Yuting and Li Jiayi emerged the combination to attract the attention as play commenced in the Women’s Doubles event at the Seamaster 2018 ITTF World Tour Platinum Australian Open in Geelong on the morning of Thursday 26th July. Similar to Singapore’s Lin Ye and Zeng Jian; they accounted for adversaries who received direct entries to the main draw. Lin Ye and Zeng Jian beat the host nation’s Jee Minhyung and Nie Mingxuan, the no.8 seeds (11-6, 13-11, 11-4), earlier Gu Yuting and Li Jiayi had overcome the European combination of Slovakia’s Barbora Balazova and Spain’s Galia Dvorak, the no.7 seeds (11-7, 11-8, 11-8). Wins contrary to status; in the remaining opening round Women’s Doubles contests that were required, it was success as seeding advised. Notably Korea Republic’s Jeon Jihee and Yang Haeun, the no.3 seeds and with seven ITTF World Tour Women’s Doubles titles to their credit, the most successful pair on duty in Geelong, made an admirable start to their quest for a podium finish. They accounted for India’s Sutirtha Mukherjee and Pooja Sahasrabudhe (11-7, 11-8, 11-3). Defeat for India and there was further disappointment, Ayhika Mukherjee and Madhurika Patkar lost to Chinese Taipei’s Cheng Hsien-Tu and Liu Hsing-Yin (11-5, 9-11, 11-6, 13-11); however, there was success for the sub-continent. Manika Batra and Mouma Das, the no.4 seeds, beat Australia’s Chermaine Quah and Michelle Wu (11-3, 7-11, 11-5, 11-4). Success for Manika Batra and Mouma Das, in the one remaining opening round Women’s Doubles engagement there was success for Japan. Miu Hirano and Miyu Nagasaki, the n.5 seeds, combined to beat Korea Republic’s Choi Hyojoo and Shin Yubin but it was close; victory by the narrowest of decisions was the outcome (9-11, 11-8, 4-11, 11-9, 11-9). in the quarter-finals, Miu Hirano and Miyu Nagasaki now meet colleagues Hina Hayata and Mima Ito, the top seeds, who were not called to opening round action; Gu Yuting and Li Jiayi oppose Jeon Jihee and Yang Haeun. In the adjacent half of the draw Manika Batra and Mouma Das confront Lin Ye and Zhou Yihan, Cheng Hsien-Tu and Liu Hsing-Yin play Japan’s Honoka Hashimoto and Hitomi Sato, the no.2 seeds, like Hina Hayata and Mima Ito not called to first round action. Both quarter-finals and semi-finals of the Women’s Doubles event will be played on Friday 27th July.